The IS-3 is a Rank V Soviet heavy tank with a battle rating of 7.3 (AB/RB) and 7.7 (SB). It was introduced during the closed beta testing for Ground Forces before Update 1.41. Keeping the same D-25T gun as it's predecessor and drastically upgrading its armour without hindering mobility too much. Anyone familiar with the IS-2 and IS-2 (1944) will sit comfortably behind the driver's controls of this behemoth. As with previous IS models, the IS-3 sports the same D-25T 122mm cannon, with its awesome destructive potential. Experienced tankers will know which weak points to look for on most targets, although the weapon's effectiveness increases dramatically once the BR-417D ammunition is researched, upgrading its penetration from 207mm to 230mm while retaining most of the HE filler. At 7.3 BR, the IS-3 will come up against many other heavy tanks with large, slow reloading guns, making the playing field much more even. Despite this, always beware the faster, lightly armoured targets such as the Ru 251, Leopard I, and other vehicles that can essentially ignore the IS-3's armour like the FV4005. As with the IS-2 mod. 1944, the IS-3 has a spindle-mounted Heavy Machine Gun, good for warding off strafing aircraft or deterring light vehicles. The IS-3 once again demonstrates sub-par maneuverability, despite being relatively light for a heavy tank. It has an engine that produces a measly 671 horsepower, making the vehicle feel sluggish when attempting to initiate a turn from both standstill and when moving. Its' acceleration also leaves much to be desired, however it does have a reasonably high top speed, and usually will reach it eventually regardless of the surface it is driving on. Fortunately, as with all late Soviet heavy tanks, the reverse speed of the IS-3 is very respectable, often allowing it the time necessary to back out of bad situations to reload or repair. The reverse gears and low forward gears allow the vehicle to climb surprisingly sharp slopes, despite what some might expect from such a large vehicle. The most obvious changes over the previous IS tanks are of course the redesigned turret and the sharply angled 'pike' nose. The front is not only angled, but the armour is also relatively thick, with 110mm on both the top and bottom, angled at 54°-56° and 54° respectively. As with previous designs, the IS-3 has somewhat sub-par side and rear armour, and angling should be avoided. The redesigned turret is much more resilient than the older designs, with more angling, a much smaller flat area around the mantlet, and significantly thicker casting. The tank is somewhat vulnerable to trap shots and turret ring penetration - these can be somewhat negated by depressing the gun and blocking the vulnerable areas. The IS-3 is the definition of a 'breakthrough' tank, which excels at close-range, front-on conflict where the chances of flanking are minimal and drivers can take advantage of the heavy frontal armour and reverse speed. When uptiered, or against certain enemies with HEAT, HESH or ATGMs, IS-3 drivers should play cautiously as the tank is extremely vulnerable to high-penetration and chemical rounds. The thickest armour of the tank is at the front – the "beak" at the front of the hull raises the effective thickness of the armour from 110 to around 180 – 200 mm, depending on the exact spot. The turret front of the IS-3 is a also fairly well armoured, with 250 mm of heavily sloped armour equating to around 400 mm effective thickness. Turret side armour is not equal throughout its length. In the side middle it is 130 mm, then bordering the rear armour is 150 mm thick. Gun mantlet side and bottom are boosted by the 250 mm of the turret front, whereas the top of gun mantlet has no armour behind it. Side armour of the hull has an additional 5 mm of sheet metal on above the suspension area. Ammo racks of the IS-3. The IS-3, continuing the tradition of the Russian IS line of heavy tanks, sports a powerful 122mm cannon, strong frontal armour and reasonable mobility for its class. As with its predecessors, it excels at despatching anything it can penetrate with its explosive-filled rounds, and relies heavily on its excellent reverse speed and sharply angled armour to keep itself out of trouble. However, an IS-3 commander will increasingly encounter HEAT, HESH and ATGMs which pose a serious threat to the vehicle. 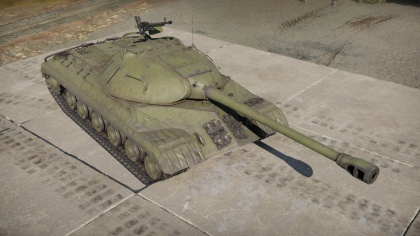 The IS-3 is relatively versatile, but excels in close-range combat against conventional rounds - it is very good at taking on other heavy tanks such as the T32 and Caernarvon. It has reasonably decent top speed, and on solid ground, acceptable acceleration, allowing it to reach cap points and combat areas fairly promptly and set up in positions to allow it to make the most of the frontal armour. When downtiered (6.3-6.7 games), the IS-3 performs excellently, able to push forward and play its 'breakthrough' role with impunity. Good climbing capabilities allow the IS-3 to reach some surprising positions for sniping or supporting teammates pushing points. Despite the gun's effectiveness being reduced at range, the armour of the vehicle becomes much more effective as weak spots become significantly harder to hit. 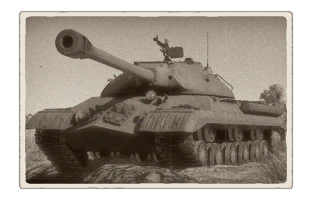 Since the IS-3 can keep up with most lighter tanks like the Centurions, Panthers or T-44s, it can be played as early-game heavy support for those lighter, more vulnerable hulls to assist in taking objectives. In uptiered games (7.7-8.3), the IS-3 can come across a lot of chemical rounds and must be played significantly more carefully, as its armour simply cannot compete with the high penetration of these rounds. Always face towards the enemies directly, avoid exposing the weak hull sides. Cover the frontal weak spots if necessary with the gun's large barrel by pointing it downwards. It's better to have the gun barrel destroyed than it is to lose crew members and be potentially unable to reverse out of bad situations. Stop only to fire. Movement makes the weak spots harder to target. Even when there is no destination to move to, go back and forth a few meters just so that the IS-3 hull wobbles a bit on start and stop. Plan aggressive pushes and movements around enemy locations. The gun has negligible depression and very bad horizontal traverse, making reacting to enemies slow and risky, and impossible if they're on lower ground. Avoid engaging vehicles over hills by climbing the hill as it will be hard to aim with only -3° depression and the lower plate will be vulnerable due to the angling. Avoid fighting tanks with HEAT/HESH/APFSDS. Be careful when brawling at extremely close ranges, as the top of the turret is quite vulnerable due to the vehicle's low profile. Avoid facing elevated opponents, as this decreases LOS thickness for hull and exposes turret top. Carrying less ammo helps increase survivability from penetrating shots to the turret (ammunition is spread around the edges of the turret). 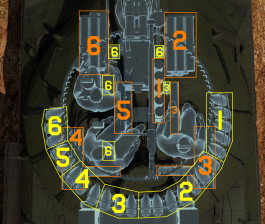 In Tier I, Parts and Horizontal Drive should of course be the prioritized modules for repairs and turret traverse speed. These two will also unlock Tier II modifications and grant access to the very vital FPE and M61 shot, the former for preservation against fires and the latter to improve damage in the battlefield. Then in Tier III, Crew Replenishment should be obtained for crew survival improvement and the APCR T45 shot for improved armour-piercing power. After that, everything else could be done at one's own priorities, but Engine should be invested for better automotive performances and M89 for the smoke capabilities. Gun mantlet is nearly impenetrable. Front glacis is shaped like a pike, and is heavily sloped. Very good reverse speed and can accelerate backwards rather quickly. Powerful cannon, can one shot the vast majority of opponents. Access to the upgraded BR-471D that makes it competitive at 7.3 battles. Tank's appearance often confuses enemy players, causing them to panic and shoot at impenetrable spots (turret, upper glacis). Can be very difficult to deal with for players who are inexperienced against this new design. Good tank for team/squad play where one can be the center of attention of the enemy by drawing fire and soaking damage, allowing more mobile teammates to flank around and engage. Rear mounted transmission, making the tank less vulnerable to fire. Incredibly long reload for main armament, even with ace crew. Reload time is around 23 seconds at best. No neutral steering, have to put in gear one and move a bit forward when turning to a direction. Mediocre maneuverability, even worse when stock without performance modules. Front glacis raw thickness is rather thin, relies on the pike to be effective. Cannot afford to be angled as this exposes the weaker hull sides and reduces the pike's effectiveness. Armour loses effectiveness significantly when uptiered. Cannon barrel is easily damaged. Bad quality optics (No enhanced zoom, only 1x and 2x options). Penetration through the frontal armour will likely detonate ammo racks or incapacitate the crew outright. Late in 1944, development of the next generation of the IS heavy tanks started, following after the IS-2 tank. The tank was to be better in armour compared to the IS-2 as a response to the new Tiger II that showed up and is able to penetrate the front armour of the hull. The project was codenamed Kirovets-1 and was headed by General Nikolai Dukhov. Design bureaus at the Chelyabinsk Tractor Plant "Tankograd" (ChTZ) and Factory No. 100 worked on the design of the vehicle. A focus on the armour improvement came from a study by an engineer in the teams that most tank losses occurred from hits to the front turret, with the front hull coming in second. The two design bureaus came up with their own ideas on how to make the armour of the tank more effective, with ChTZ developing an extremely rounded turret and No.100 developing a new angled front armour in a shape of a "beak". Soviet command decided that the design should use both features in the armour as both ideas were promising. The prototype vehicle was then produced at ChTZ and completed in October 1944 when it trialed and accepted for production as the IS-3. Production for the IS-3 started in 1945 at ChTZ alongside the IS-2 production. As the first tanks rolled off production lines, it was determined that the design was rushed and unproven with its multiple mechanical problems, some of which included the armour plates welds cracking open from the vibration of cross-country movement and muzzle blast from the gun. Because of this, the IS-3 were not available in large numbers to be committed into battle, leading to their absence in the final months of World War II before Germany surrendered in May 1945. Despite its rough introduction and prevalent mechanical issues, the IS-3 continued production with gradual fixes to the front hull, final drive, and engine mounts. The Chelyabinsk factory produced IS-3s from 1945 to 1951 for a total of 1,800 tanks. Though the IS-3 was not available in large numbers at the start, the Soviets attempted to transport the IS-3 to Germany in April 1945 to assist in the fightings, but they arrived too late to be committed to any fighting. It is reported that the IS-3 did see service during the Soviet invasion of Manchuria in August 1945 to fulfill Stalin's promise in the Yalta Conference to invade Japan after the capitulation of Germany, however not much information is present about this topic. The end of the most destructive war in history did not waver the Soviet's opinion of the IS-3 however, and the Soviet command had the 52 IS-3 tanks from the 2nd Guards Tank Army paraded in the Berlin Victory Parade in September 7, 1945. The reveal of the IS-3 in the parade came as a huge shock to the Western Allies who saw the IS-3 as a nigh-invulnerable breakthrough tank with their heavy armour. The response to the tank was their to develop their own heavy tanks able to do the same job and with a gun able to fight the IS-3, such as the British Conqueror and the American M103 heavy tanks. Despite its very ominous stature, the IS-3 was still plagued with mechanical issues at this point with its poor armour quality and mechanical reliability. A short modernization program from 1948 to 1952 was made to fix these issues with tanks in production and in the depots with no change to the name designation. The IS-3 were then modernized further in the 1960s to keep it up with changing times. The modifications done were similar to the IS-2M, which gave the IS-3 extra external fuel tanks, stowage bins, and protective side skirts as well as an improved engine, engine filtration, new radios, new machine guns, new gun optics, and many more small changes. The modernized IS-3 was named the IS-3M. One of the few actions the IS-3 saw in the post-war era with the Soviet Union was in 1956 during the Hungarian Revolution with a single heavy tank regiment. The Soviet's heavy tank regiments used to consist of 21 heavy tanks during World War II. In 1947, the regiment composition is changed to between 44-46 heavy tanks and 21 heavy assault guns in a mixed formation. Another change between 1958-1959 saw this mixed unit changed to consist of only heavy tanks, but now consists of up to 100 heavy tanks. Despite their armour, a number of heavy tanks were lost before the Soviets were able to crush the revolution. The IS-3 after that did not see much action afterwards in the Soviet Union's hands before it started to be replaced by the newer T-10 heavy tank in the 1960s. During this time, many heavy tanks were transported to the border between the Soviet Union and China in face of the rising tension between the two countries. The IS-3 would also be supplied to the Soviet Union's allies such as Poland, Czechoslovakia, North Korea, and Egypt. Poland and Czechoslovakia never adopted the tank after trials however, thus leaving only North Korea and Egypt as the main foreign users of the IS-3. The Egyptians used the IS-3M, 100 of which were received from the Soviets, against the Israelis in the Six-Day War in 1967. Of all the tanks used in that war, the IS-3M was the most feared by the Israelis due to the thick front armour. Israeli infantry's standard anti-tank weaponry could not penetrate through the front, and tanks as modern as the M48 Patton also could not defeat the IS-3M. Nevertheless, the better tactics and training among the Israeli tank units were able to prevail against the IS-3M, with the IS-3 being commented by the Egyptians for its low rate of fire and outdated fire-controls to the crew's deficiency in combat. Of the 100, 73 tanks were lost during the Six-Day War. The Israeli managed to capture a number of IS-3 and pressed them into service, though only for a short period before its faults become more problematic than its benefits. The engine on the IS-3 proved to be unsuitable in the desert climate of the Middle East, and an attempt by the Israeli to alleviate this by replacing the engine with one from the T-54, though this did not prove fruitful. In the Yom Kippur War in 1973, both the Egyptians and Israeli used the IS-3M to a smaller degree than the Six Day War, the IS-3 not seeing much combat in the Egyptian forces and were used as dug-in pill boxes on the Jordan River by the Israelis. With the introduction of the lighter and more mobile T-54 main battle tank in the 1950s, the IS-3 saw less usage among the Soviet front-line as it started to become obsolete. Further development to improve and continue the IS tank series became the IS-4, IS-7, and the T-10 tanks. However in 1960, Nikita Khrushchev, the new premier of the Soviet Union after Stalin died, ordered heavy tank production to be terminated in wake of a new military strategy of missiles rather than conventional forces. His orders are not without reason, heavy tanks are difficult to maintain and transport across the huge Soviet Union, which also did not have many bridges that could support a heavy tank. Another reason was the changing anti-tank technology that made tank armour extremely vulnerable, especially against the new anti-tank missiles that are becoming more and more efficient at their task in destroying tanks. Still, the order did not mean the dissolution of heavy tank units as by 1978, there were still up to 2,300 heavy tanks in the Far East. To this day, many heavy tanks are still either in inactive reserves or dug in as pillboxes along the borders of the Soviet Union. The heavy tank's place in the Soviet Union's military was replaced by the main battle tanks (MBT) like the T-64, which presented a much better firepower, armour, and mobility for only a weight of 35 tons, a technological sign on the rising prevalence of the MBT.